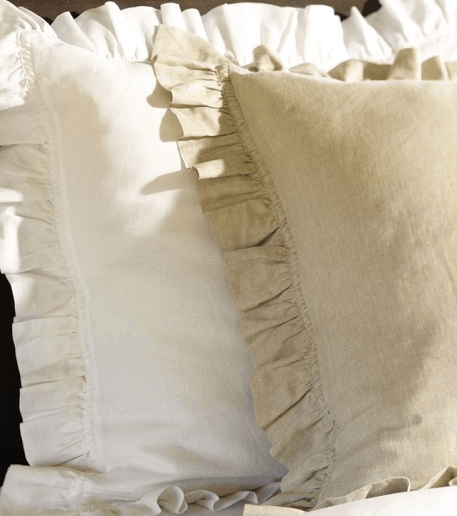 100% linen European shams from Pottery Barn. They have a nice feel and are on sale! (that I already had) is a starting point. hand blocked wallpaper from India. it myself with a paisley stencil? Let me just say that I am not a DIYer, and I mean NOT. So, this little project had me terrified. 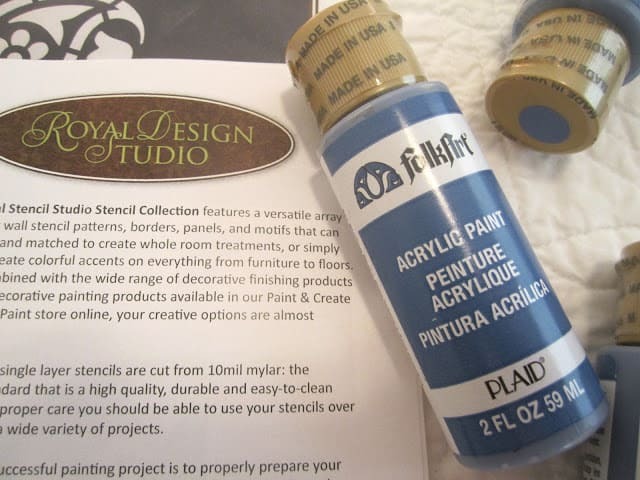 As soon as the $29 stencil and stencil brush arrived, I went to Michaels to buy the $.89 acrylic paint in a denim blue. I did a practice run on some cardboard. Not bad…now to tackle the WHOLE wall. translated it to the wall with painter’s tape. This was NOT fun at all. I made a couple copies of the print so I could get a feel for the scale. 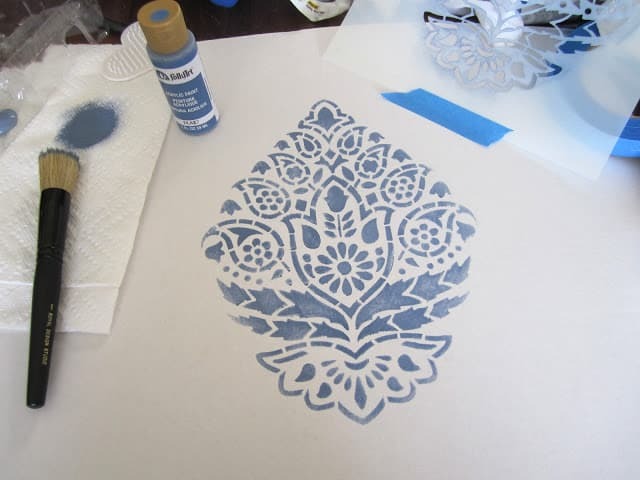 I messed up one stencil (smudges–but I can fix it with the wall paint and a little brush). It was nerve racking each time I pulled the stencil off. The trick is to not get too much paint on the brush and to blot the paint brush on paper towels frequently. Also, I wanted it to look hand blocked so I varied the concentration of paint a bit. You’ll see the finished product next Wednesday. I spent less than $45 for the whole wall! It only took one little tube of paint. 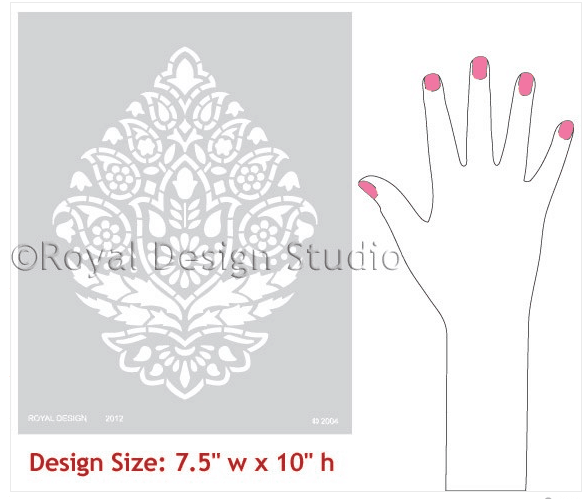 We are going to use the stencil next in a friend’s bathroom…it’s reusable. I’m going to be doing something with this next. It looks amazing!! I think you are a DIY'er in the making 🙂 I am a huge fan of hand blocked wallpaper and your wall looks just perfect. Your wall looks gorgeous, Mary Ann! I'm very impressed! I'm not a DIYer either and completely understand what I big deal this would be! Your room is going to be BEAUTIFUL. I can't wait to see it completed! oh this looks so great! Linda and I have been talking about stenciling. You've made it look so easy! wow!!! looks fantastic! 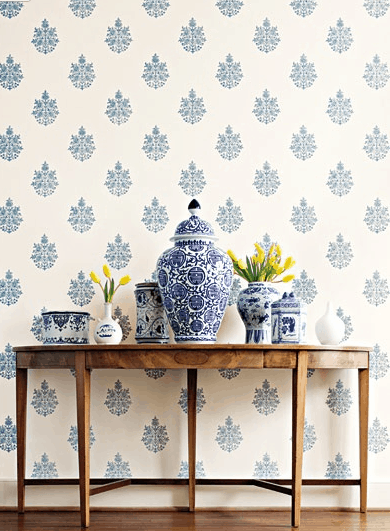 i thought i was over stencils (have two in my house to mock wallpaper) but this is a whole new level of goodness! Such a great alternative! It's looking good! You really made this DIY project your own! I love it! I can't wait to see this – I would have been terrified. I know it is fabulous! I am SO Impressed! Awesome idea and great execution. You ARE a DIY'er after all! Loved this update…can't wait to see what else you're doing! Mary Ann! 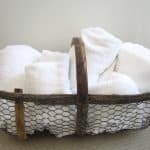 What a DIY coup- it looks fantastic and Im so proud of you for trying..and succeeding! You are inspiring. I love that design and look how much you saved. It is going to be great, already is. 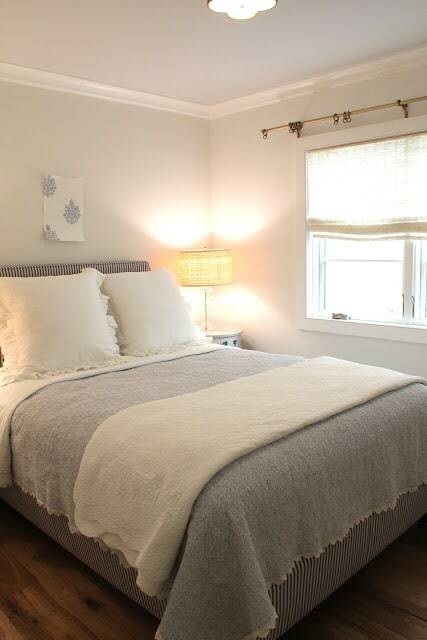 Love the ticking stripe bed. I want to be your house guest! i think the wall turned out BEAUTIFULLY. 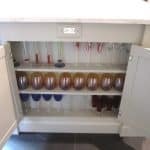 pretty darn amazing for a "non diy'er"!! Ooh, I can tell already this room is going to be great! Can't wait to see more. Oh my gosh!!! Gorgeous!! I am SO BAD at DIY. You are my hero:). AMAZING! I think $45 is a MUCH better use of makeover funds then having to shell out for the wallpaper. This came out so fab, I cant wait to see more now! 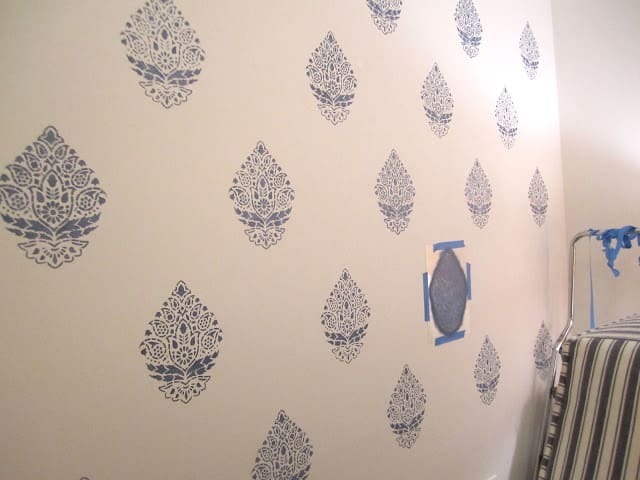 That stencil is a GREAT alternative to the cost of that wallpaper. You deserve a big pat on the back not only for saving a lot of money but doing such a great job. Very impressive! Mary Ann this is fabulous, it's incredible what an impression it makes and how professional it looks – I can't believe you did it yourself and how much money you saved! Oh my gosh, I love the stencil! Love, love! Can't wait to see it all come together. I love this! I might think about doing something like this in my oldest's next room. And to think at a fraction of the cost of the wallpaper. Nice job! 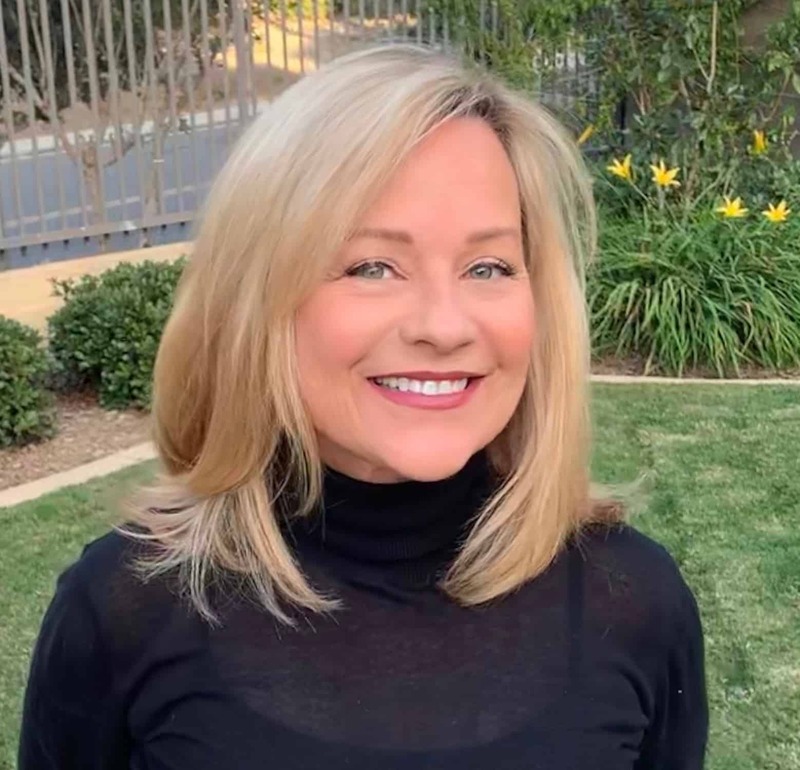 Mary Ann, Wow….you did a fabulous job! I give you an A+++. And being a DIYer myself, I KNOW that was a difficult job to take on. Just the grid on the wall would be a nightmare to do! Great job! I've always loved that wallpaper, but I love what you did even more. 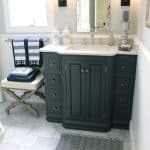 You've given me an idea for my downstairs powder room!! Can't wait to see the room finished. I know it will be a showpiece! Gail, that is a HUGE compliment coming from you. Want to borrow the stencil after Debbie? I love where this is going and that stencil adds so much to the space. Good for you for taking the risk – it's paid off! It looks so good!!! Yay for stepping out of your comfort zone!! 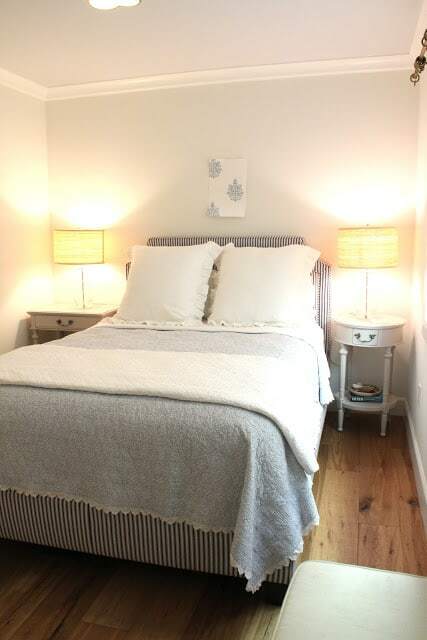 Oh Mary Ann, here you go making yet another room that I am going to be drooling over. I am so not a DIYer either so I really applaud your courage taking on such a difficult task. And WOW you did a fantastic job! So impressed!! Super excited to see what's next. Loving it so far! I love your translation of the wallpaper. 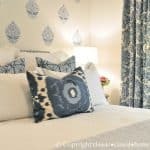 My husband stenciled ikat all over my dining room wall, so I understand the frustration you feel. Though not with the wall, we have had to graph things out to get it right and it's not fun. Shut Up!! This is perfect. I think everyone is a DIY-er at heart, and now you are officially bitten by the bug…I can tell. I love this room, already. Like Julia mentioned, I think we will be copying you on this one. Excuse me, you are so a DIYer! It looks fantastic. I love Indian designs, we use them in our house (husband is from India) I just used a similar stencil on a little tray table that I chalk painted with Annie Sloan but used gold leaf. It looks so pretty, Mary Ann. I know you are thrilled with the results. Completely worth the effort! What the …..you just out did your self!!! I am completely impressed with how this turned out and I might need to give this a try!!! Mary Ann, you have out done yourself! It turned out amazing! The spacing is perfect. So, so impressed. You must be thrilled! Mary Ann, I'm planning something SO similar!! Yours turned out great. I just love hand-blocking. It's good that its not perfect, and it looks so pretty. Love it! It looks fantastic! I can imagine how nerve wracking that would be! 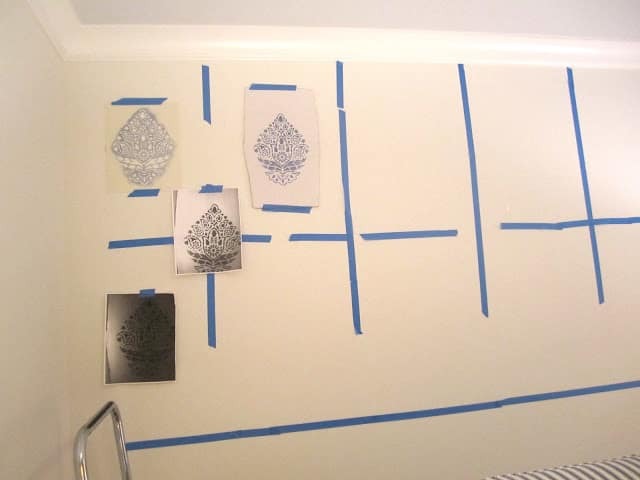 manually stenciling the walls? that is really awesome! Awesome job!!!! Can't wait to see more!!! 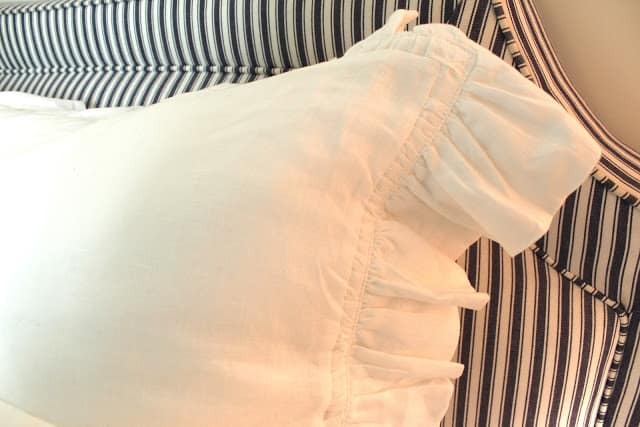 I love it – it is the perfect compliment to the ticking stripes. Now I want you to head on over here and stencil a wall for me since you are now the pro. By the way, you can no longer say that you are not a dIYer! You have joined the club. Mary Ann, so impressive for a self proclaimed non DIYer! It looks beautiful! Wow. You are a brave woman. Like Bethany said, I thought I was over stencils. This is just gorgeous, even better than the $550 option! You have me reconsidering wallpaper in the kitchen for a stencil. Bravo. You GO girl! It looks great. The wall is looking fabulous, Mary Ann. You can't say you are not a DIYer ever again. The completed project is bound to be a winner. 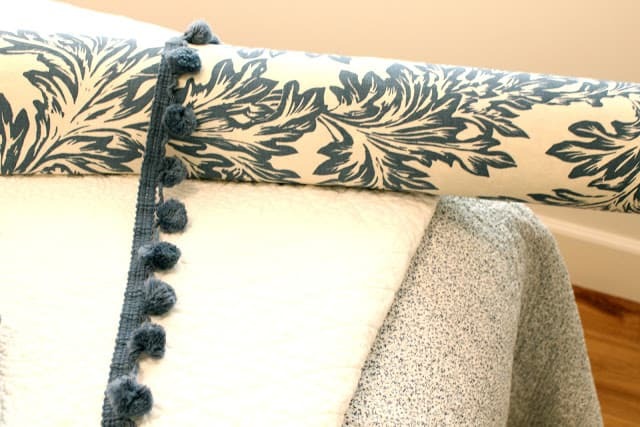 Where did you get that lovely matelasse coverlet with the picot edge? Love it. You are so clever…the wall came out so pretty. Looks like you are off to a great start on your project! Mary Ann…it looks amazing. 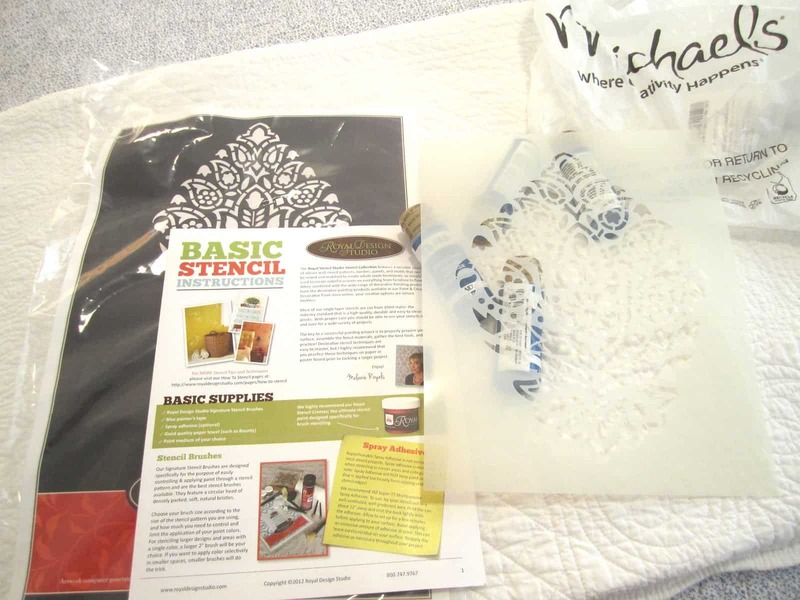 What a great idea to stencil and you saved a bundle! What can I say…. You rocked it!!! Oh, I was just thinking you could do it on fabric too!!! Gorgeous! Love your wall, bedding and the colors are so soft and pretty! I am SO impressed! I'm terrified of trying something like that but it looks amazing! Congrats on saving tons of money too! So far it looks beautiful. You did an amazing job with the stenciling I cant wait to see the final project. Mary Ann….you did a GREAT job. I don't consider myself a DIY-er but I have tackled many DIY projects. Your room is going to be great! Well, you weren't a DIY'er, but now you are a pro. That wall looks great! Love this so far Mary Ann! So cool, Mary Ann! Can't wait to see the finished room! Love ALL of your ideas- crafty or not! So awesome! Have you seen Miss Mustard Seed's fabric wall. This is a similar look at a great price. Love it! Love the room Mary Ann ! It looks great so far and I can't wait to see the finished product! I'm really loving the stencil, I've thought about trying that on some white ikea curtains. Maybe I'll give it a try now that I have seen how great your wall has turned out. Have a great weekend! It's going to be amazing, Mary Ann – just love the stencil!! I am honestly in awe.. you are truly amazing…. absolutely, positively BRILLIANT!! Mary Ann! This is amazing! I love it and can't wait to see the whole wall. Brilliant!! Oh my goodness!! This is fabulous!! Can't wait to see the finished product!! I know it will look awesome! And so much for not being a DIY'er, right!?? I can not wait to see how this came out!!! Looks like it will be awesome! How did I miss this??? You are a genius…wanna come here and work your stencil magic on one of my walls:) I soo cannot wait to see this finished room, its already looking amazing! Great work, Mary Ann. Your room is already looking very pretty now, can't wait to see the final results, I know it will be even more amazing! Love your beautiful ticking bed, by the way!